The EU promised to open its doors to the Western Balkans 15 years ago and recently recommitted to make this happen. But although the region now benefits from EU pre-accession funds and several programmes, none of its six countries (including Kosovo) expect to become EU members before 2025. This fragile region – still struggling with reconciliation three decades after civil war – also faces new problems like populism, a resurgent nationalism, and a democracy deficit due to weakened mainstream media. Is accelerated regional cooperation the best solution to all this? New political momentum is building for stronger ties between the EU and Western Balkans. This was an encouraging conclusion of the Friends of Europe’s 2018 Balkan summit, held in Brussels on 4 December. The event featured a range of different state and non-state actors, with a stimulating debate on the region’s opportunities and challenges. “The European Commission is doing everything possible to support the Western Balkans countries’ economic reforms and in fields like the rule of law, democracy and fighting corruption. Their challenge is broader transformation – choosing to align with EU culture and politics and so on – and not just piecemeal reforms,” said Christian Danielsson, European Commission Director-General for Neighbourhood and Enlargement Negotiations. Regional participants said EU funds, notably the Instrument for Pre-accession Assistance (IPA), are much valued for new infrastructure, growth and jobs. Yet one speaker commented that unless these funds are rapidly increased, countries there won’t catch up with today’s EU members for another half-century. Youth, the vast majority of Western Balkans populations, are further cause for concern. There were calls for greater EU support to tackle the region’s high youth unemployment, which creates a braindrain problem too. Specific regional challenges also need fixing fast, especially visa liberalisation for Kosovans. Unless the EU enables this scheme soon, Kosovans may turn away from Europe and its promises. The implication was that the region’s citizens could prefer other global players, such as Russia or China. There was overwhelming support for more regional connectivity – whether physical (transport, energy, etc. ), digital (e.g. new initiatives for open data access or empowering women), or cross-border between people. On the human side especially, civil society organisations (CSOs) are doing great work. The Regional Youth Cooperation Council for example runs 35 projects focused on youth cooperation, including student exchanges. “Better connectivity among Western Balkans countries is key to their EU accession,” argued Majlinda Bregu, Secretary-General of the Regional Cooperation Council. The audience learned of positive efforts to tackle a shrinking media space, with all its inherent dangers for peace and democracy. Here the EU is supporting free and independent media, through its media freedom guidelines and the European Endowment for Democracy. Several CSOs are even engaged in fact-checking against fake news – or what the EU calls ‘disinformation’. “People in the Western Balkans need access to manipulation-free independent media. 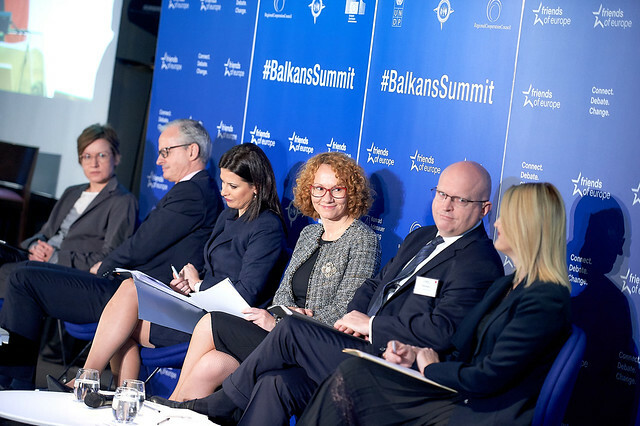 If well-informed, they will be more involved in regional democracy,” added Jasna Jelic, Head of the Western Balkans Task Force at the European External Action Service. In a region traditionally tainted by corruption and violence, there was good news from Albania. It’s engaged in a radical judicial vetting process, also with EU support. This initiative should serve as a useful reform model for neighbouring countries. It could also underpin a region-wide drive for more transparency – a vital element of all future Western Balkans cooperation.